Warehouse worker Drew Jacobs drives a forklift through the stacked tire rims stored within the old K-Mart building in St. Marys. LIMA — The empty Home Depot building on Cable Road has been closed longer than it was open. The national construction retail chain built its 95,000-square-foot facility in five months in 2002, but by 2008, a lackluster $11 million in annual sales and heavy competition from Lowe’s and Menards forced corporate to close the doors. They’ve remained closed since. For a decade, the building has sat unused and largely ignored. Today, weeds break up the cement parking lot, forcing cracks and creating what looks like a set from a post-apocalyptic movie. Big-box retail isn’t what it used to be. Due to enhanced competition from online sales, the retail experience from the 20th century has struggled in the 21st, and the region has a new challenge in utilizing the blighted properties left over from major chains who couldn’t make it in the tight market. While plenty of empty storefronts remain, a few local entrepreneurs have found ways to adapt a few of these properties into new retail and service experiences. Big box retail may have taken a few hits, but that doesn’t mean the region has to suffer the consequences. While most big-box retailers tend to build new facilities in order to tweak their brand experience, other businesses are more concerned about size. Case in point: American Manufacturing Solutions in St. Marys. When KMart left their building, American Manufacturing Solutions President Jason Clark saw an opportunity in the 58,000-square-foot building. When Clark was scouting out the facility with business partner Andy Sloane, the City of St. Marys had actually been making plans to demolish the building and set up an industrial zone. Under the leadership of Mayor Pat McGowan, the city was days from going out to bid after receiving funds from the state to tear the building down. But Clark’s interest set up an alternative. Instead of tearing down, they could build it back up. Over a three-month period, Clark was able to rip out the majority of the interior of the building and added a brown exterior that masks the building’s prior debilitation. Inside, hints of what the space used to be can barely be seen. Except for a few old store tiles here and there, the space now looks like what Clark had imagined when he first looked at the building — a warehouse. Tens of thousands of car rims are now stacked throughout the space to serve local automobile manufacturers. “The city was made whole on this whole deal. We don’t want to be involved in the business of buying and tearing down property,” McGowan said. Clark said he and Sloane had been running a warehousing operation out of a 8,800-square-foot building, and the two began looking for a place to expand as business began to ramp up. With their new property updated, they’re looking to expand into logistics and shipping next. They’ve already purchased a few semi-trailers as well as an additional 50 feet on the building’s south side, which should allow trucks to better maneuver near the building’s loading docks. “We really appreciate working with the city and working with the community improvement corporation, turning that eyesore out there and giving it new life,” Clark said. Lima Office Depot/Clyde Evans Land Co.
Dave Evans’ first priority when considering what former big-box property to flip is location and visibility. And then he looks for renters with a vision for their business. He’s not a fan of “me too” businesses — those replicating similar successful businesses in the same area. With those two variables hammered down, he doesn’t mind risking the sometimes hundreds of thousands of dollars needed to turn a former big-box retail space into multiple units. He’s done as much with Lima’s former Office Depot and the location of the Rapid Fired Pizza on Elida Road — setting up walls, adding bathrooms and updating HVAC systems to deal with multiple tenants. “I’m finding out the smaller spaces are working. The big boys build their own. The smaller ones are still doing well,” Evans said. Evans’ experience reflects some of the same larger market trends affecting retail. Due to online competition and the increasing desire for customized experiences, smaller businesses can thrive in niche markets that big box stores can’t survive on. “If people have a good vision and they know what they’re focused on and they have a good game plan, they can still make it,” Evans said. “The day of delivery and Amazon is so big, but there’s still room, and that’s what I like. Evans’ latest project in Lima is to bring an auction house into the area. He’s looking to have something in place by August. He’s also considering projects that group businesses with similar market demographics. For example, he said he’s seen retail spaces in Columbus group day cares near dance studios to create family centers for mothers and their children. Clark and Evans aren’t the only individuals renovating old properties. Other examples include Big-R moving into the old Lima Walmart, ALDI working with the old Harding Highway KMart and Chevrolet of Ottawa moving into a retail space on Perry Street. John Navin, dean of the Dicke College of Business Administration at Ohio Northern University, said businesses who find homes in prior big-box stores usually don’t have the same corporate restrictions that force major retail chains to build entirely new properties. They also aren’t pushing the same business model of those that once sat in those places. “You’re probably not going to replace them with the same type of industry as before. There’s a reason that the building is empty,” Navin said. Instead, businesses will have to be creative in how they imagine the old space. Navin named small manufacturers and educational centers as other options that could use extensive square footage. 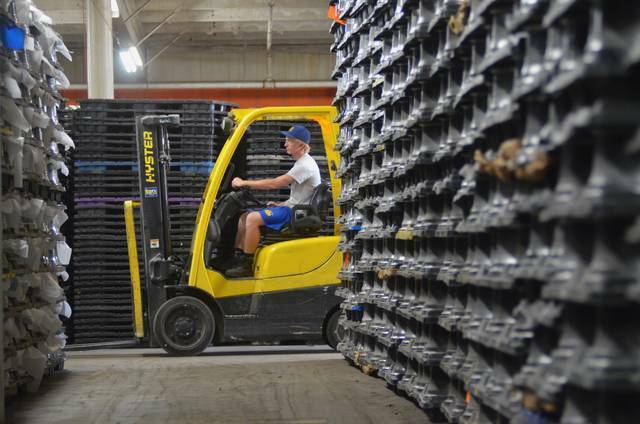 https://www.limaohio.com/wp-content/uploads/sites/54/2018/07/web1_Warehouse1.jpgWarehouse worker Drew Jacobs drives a forklift through the stacked tire rims stored within the old K-Mart building in St. Marys.